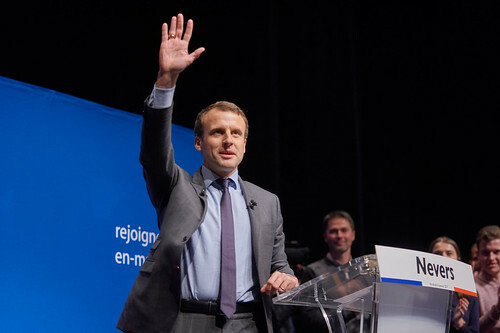 Macron’s team stayed ahead of the hackers – but only just. Photo by villenevers on Flickr. Terribly odd how it’s only the candidates who support the continuance of existing western organisation who get hacked. Seems Macron’s team were one step ahead of that, though. One document was wonderfully fake: it referred to a bitcoin transaction on a block number that doesn’t yet exist. Didn’t stop the alt-right loons from celebrating what they thought it revealed. Fact-checking isn’t much of a thing nowadays. On his blog, Dominic Cummings [campaign strategist for Vote Leave, the official Leave group] has written thousands of words about the referendum campaign. What is missing is any details about his data scientists. He “hired physicists” is all he’ll say. In the books on Brexit, other members of the team talk about “Dom’s astrophysicists”, who he kept “a tightly guarded secret”. They built models, using data “scraped” off Facebook. This is a complex tale; Cadwalldr is wrestling with people who don’t want things to be known, and who seem to have done questionable things. Global smartwatch shipments at 6.2m units in Q1 2017 were up 48% YoY. Apple’s watchOS maintained the top spot with 57% market share. Tizen with 19% share took second place from Android Wear this quarter for the first time since Q4 2015. Android Wear vendors together accounted 18% share and took the #3 rank. That makes it 3.5m Apple Watch units, Tizen at 1.2m, Android Wear 1.1m. My data from Google Play suggests only 0.6m or so Android Wear devices activated in that period, though possibly quite a few were connected to iPhones (where data isn’t easily available). there’s many moments where a voice assistant is really beneficial, but that doesn’t mean you’d never want a screen. So the idea of not having a screen, I don’t think suits many situations. For example if I’m looking for directions and I’m using Maps, Siri can tell me those directions by voice and that’s really convenient but it’s even better if I can see that map, and I can see what turns are coming up, and I can see where there is congestion, I understand better my route, and what I’m going to do. Or, for example, with photography, and one of the most popular reasons for our products is photography now, and photography requires a screen. So the idea of a device without a screen, well it’s not really useful for that whole category of photos that we all share. Given that some are suggesting Amazon’s next iteration of the Echo will have a screen, this could get edgy. Except isn’t an Echo with a screen just… a tablet? The point on pricing has lots of developers quietly agreeing. Google originally promised that Android apps would be broadly available on Chromebooks by the end of 2016. And media reports throughout last year were perhaps overly positive about Google’s expected impact on Windows PCs and Macs. This was supposed to be game-changing. To be clear, if Google can pull this off, Android apps on Chrome will indeed be disruptive, as I openly pondered a year ago in Can Google and Apple Pull the Plug on the PC Market? A June 2016 video described the wonders of this solution. And then things got silent. As I wrote in January, in Still Waiting for the Chromebook Revolution that Never Came (Premium), Google’s late 2016 promise was smoke, and only a very slim selection of devices ever got Android app support, and then only in pre-release form. The back-to-back releases of the Samsung Chromebook Plus and Chromebook Pro in early 2017 were supposed to turn things around. These Surface-like hybrid PCs offer touch screens and pens, and can be used like a traditional laptop or like a tablet. There’s just one problem: Samsung has only released the Chromebook Plus so far, and this expensive device hasn’t moved the needle at all. The Pro, which features an ARM processor instead of an Intel processor, was delayed from March to April. And then to May. And now we’re told that this new version of the device will ship sometime “this spring.” And according to many reports, the reason for the delay is, yep, you guessed it, that Google actually cannot figure out how to combine Android apps and Chrome OS. This attack that Google announced a year ago is effectively vaporware. Fair comment, but if Google is taking the time to get this right, rather than rushing it out of the door half-done, that’s got to be a good thing. A huge number of second-tier “microvendors” are playing a meaningful role in the global smartphone market. However, industry consolidation is underway. The “top 30+” vendors worldwide, like OPPO, together grew +8% YoY in Q1 2017, in contrast, the next “top 100+” microvendors combined posted -8% YoY decline. We believe supply constraint and component price hikes hurt microvendors’ performance over recent quarters. All microvendors together made up 11% of global smartphone volumes during Q1 2017. Microvendors, like Lefeng and Xiaolajiao in China, Reliance Jio in India and INNJOO in Africa, are growing faster than average. However, we tracked some small vendors have been pushed out of market over the past few quarters, due to lack of scale to counter price hikes. “Microvendors” is a great word. But one can imagine them mostly being in China, and getting squashed there as the smartphone tide goes out a little. Europe and the US don’t offer much chance. The 5% were customers of Google Preferred, YouTube’s program for advertising on its top-tier videos. It is bought in an “upfront” style, meaning companies commit advertising money before programming runs. But that doesn’t mean they can’t back out. Five% is not insignificant, but it would require more defections for the company to really feel the impact. Mizuho said if 10% of brands pulled their ads, it would decrease the company’s earnings per share by $0.15 cents this year or a little under 1% of the value. You’d imagine if they’re the top 5% that they’d be bigger spenders than, say, the bottom 5%. Which in turn implies that it lost more than 5% of its revenues (assuming MediaRadar is correct). Which makes this a problem Google needs to get on top of – but the only way to do that might be to stop ads on some videos. That might increase CPMs (price per ad space), but will it increase revenue? This attack, the researcher argued in the message, hinges on creating a malicious application and registering it on the OAuth service under a name like “Google,” exploiting the trust that users have in the OAuth authorization process. OAuth is a standard that allows users to grant websites or applications access to their online email and social networking accounts, or parts of their accounts, without giving up their passwords. It is commonly used throughout the web, and typically shows up as a menu that lets you select which of your personal accounts (such as your Google or Facebook account) you want to use to sign into or connect to another service. “Imagine someone registers a client application with an OAuth service, let’s call it Foobar, and he names his client app ‘Google, Inc.’. The Foobar authorization server will engage the user with ‘Google, Inc. is requesting permission to do the following,'” Andre DeMarre wrote in the message sent to the Internet Engineering Task Force (IETF), the independent organization responsible for many of the internet’s operating standards. “The resource owner might reason, ‘I see that I’m legitimately on the https://www.foobar.com site, and Foobar is telling me that Google wants permission. I trust Foobar and Google, so I’ll click Allow,'” DeMarre concluded. Very good find. Nothing is really new under the hacking sun. This was probably rediscovered by the perpetrator last week, rather than filed away for reused. But Google should have noted it in the OAuth threat model – it was added, according to a later message in the thread. [Thomas] Clark doesn’t have much of an inside track on what’s going on in Westminster and he’s not even particularly aligned with any single political party – with the exception of holding strong anti-Tory views. In fact, he’s a thirtysomething part-time English tutor originally from the Yorkshire Dales who has never previously spoken to the media and was quite happy to keep a relatively low profile until BuzzFeed News got in touch. Clark’s site, Another Angry Voice, is attracting a readership that most mainstream news sites would kill for. Despite still being hosted on an old-fashioned Blogspot account and relying on donations for funding, it’s reaching millions of people with a combination of endearingly homemade memes, Facebook-friendly headlines, and a regular output of relentlessly anti-Conservative takes on the news. Recent mega-viral hits include “How many of Jeremy Corbyn’s policies do you actually disagree with?”, “30 things you should know about the Tory record”, and “The systematic Tory abuse of disabled people”. That thing about “the most viral political journalist” in the UK is where you should pause. Electoral results from the council elections saw Labour trounced and the Tories ascendant. Being a viral political journalist is nice, but there’s no evidence – if anything, this is counter-evidence – that it affects how people vote. The Labour MP suggested the sites were the modern equivalent of “the six nutters who sell the Socialist Workers Party newspaper in any town centre” but they were being boosted by an online echo chamber.